The 1950s were the heyday of the coach trip. 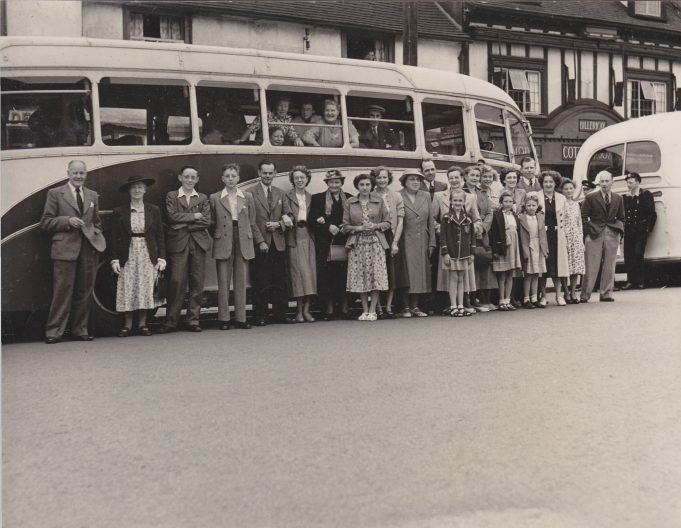 This photograph shows many of my relatives on their way to London for the day in around 1950, certainly before I was born. The coaches can be seen in the High Street outside Cottis the bakers just before setting off. In front of the coach, fifth from the left, is my father James De Ros and next to him my mother Yvonne De Ros (nee Segers). My grandmother, Helen De Ros (nee Melrose) is standing next to my mother and one away from her, ninth from the left, is my great aunt Eleanor De Ros. On the Coach The lady with her head slightly out of the window is Mrs Poulson and the man to the right of her is Nicholas De Ros my grandfather. I don’t know what the make up of the coach party was or who the other members are but it would great to find out if anyone else is recognised or why they were going to London.